Private 13908 Christopher Augustus COX, V.C. "Private Christopher Augustus Cox No. 13908 For most conspicuous bravery and continuous devotion to duty when acting as a stretcher bearer. During the attack of his Battalion the front wave was checked by the severity of enemy artillery and machine gun fire and the whole line had to take cover in shell holes to avoid annihilation. 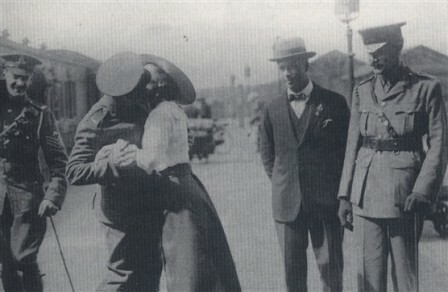 Private Cox, utterly regardless of personal safety went out over fire swept ground and single handedly rescued four men. Having collected the wounded of his own battalion, he then assisted to bring in the wounded of the adjoining battalion. On the 2 subsequent days he carried out similar rescue work with the same disregard to his own personal safety. He has on all occasions displayed the same high example of unselfishness and valour." Christopher Augustus Cox was born Christmas Day 1889 in Kings Langley and in 1912 he married Maud Swan with whom he eventually had eight children. Christopher enlisted into the army among the swathes of men who answered Kitchener's "Call to Arms", on 4 or 5 September 1914, becoming a Private and Stretcher Bearer in the 7th Battalion of the Bedfordshire Regiment, 54th Brigade, 18th (Eastern) Division. He landed in France with the battalion in July 1915 and was wounded in the leg on the infamous opening day of the Battle of the Somme - 1st July 1916 - when his battalion stormed, captured and held not only the first two German trench lines but their final objective, the Pommiers Redoubt. Private Cox was back with the battalion in time for the storming of Thiepval and the Schwaben Redoubt in September 1916 and served through the winter of 1916 / 1917. He came through the assault on the Miraumont trench system in February 1917 unscathed, during the Ancre operations and won his Victoria Cross in March 1917 when his battalion was one of those who pursued the Germans as they fell back onto the formidable Hindenburg Line defences. As the Operations on the Ancre continued over the winter, Germans forces conducted a methodical withdrawal from Miraumont and the surrounding positions, with British units following closely behind stopping when they met the 'new' German defensive line around Achiet-le -Grand . 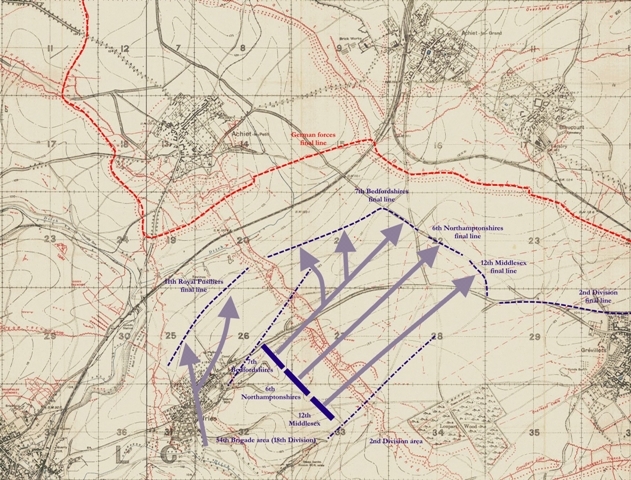 As these operations developed, the 18th Division received orders to move to the area East of the River Ancre, with the 55th Brigade advancing to positions south of Irles and the Grévillers Line. The divisional line was narrow, with a single brigade in the front, a second in support and the third in reserve, all battalions in the front holding a deliberately narrow frontage but having support available in depth. 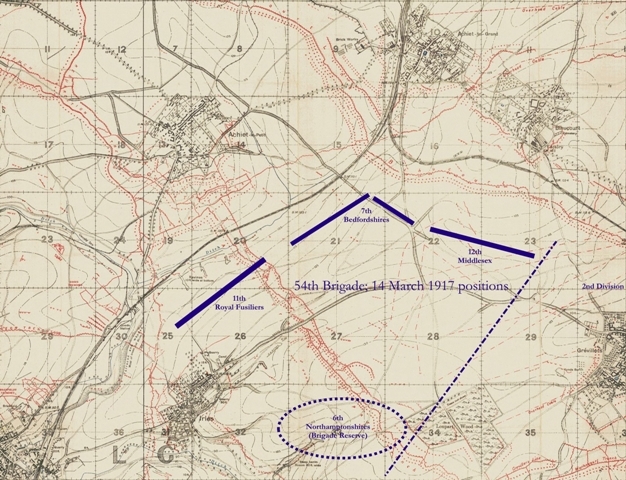 On 2 March, the 54th Brigade moved into Divisional Support from their rest area around Martinsart to the Thiepval area, the Bedfordshires being placed in dugouts and tents around Saint-Pierre-Divion as operations continued to their north-east. 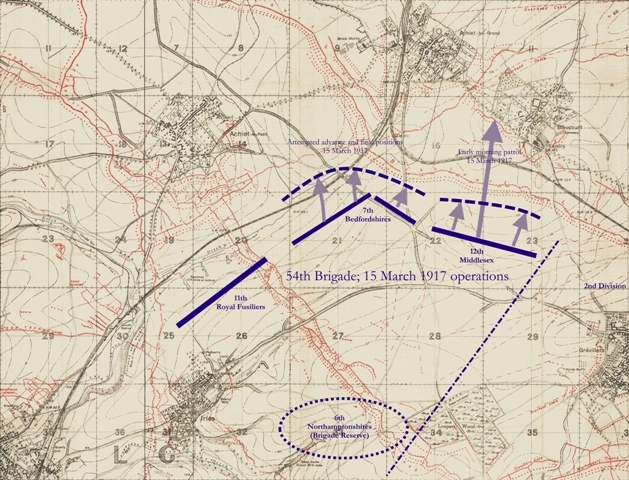 10 March saw the 53rd Brigade capture Irles and the trench line south of the village, their relief arriving overnight on 12/13 March, when the 54th Brigade took over the sector. 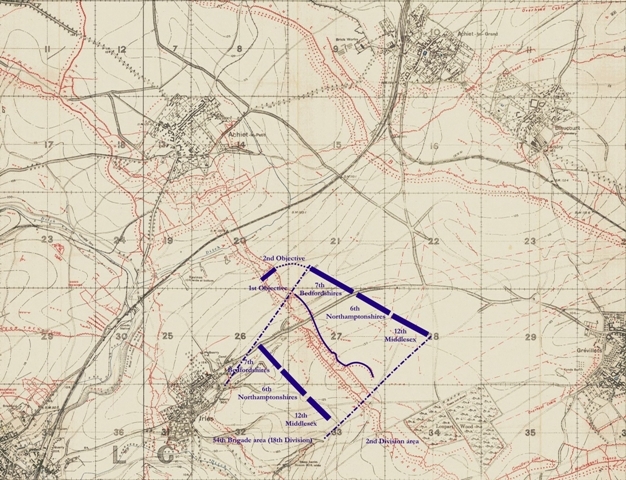 The Brigade came into the line with the 62nd Division on their left facing Achiet-le-Petit and the 2nd Division on right facing Logeast Wood; the Bedfordshires took over a line of shell holes and strong points north-east of the ruined village of Irles, 200 yards south from the Loupart Trench section of the Grévillers Line. To their right were the 6th Northamptonshires, with the 12th Middlesex extending the brigade line until it made contact with the 2nd Division. In Brigade support were the 11th Royal Fusiliers, who had their eyes on the open left flank around Achiet-le-Petit, as the village was still in German hands. The night was very dark and relief was not completed until around 6 a.m. as the area was completely unknown to the incoming troops who had no knowledge of where the line of outposts and strong points had been placed. They deployed with orders to conduct a frontal assault against the Loupart Trench line that same morning but while the relief was in full swing, at around 3 a.m. a report arrived that a New Zealand patrol to the right of the 2nd Division had entered the Loupart Line, on the SE corner of Loupart Wood. Initial reports suggested that they had found it uninhabited after exploring at length. The 54th Brigade's battalion C.O. 's sent their own patrols into the Loupart Line to their front and found it similarly vacant, the occupants having seemingly moved out overnight. 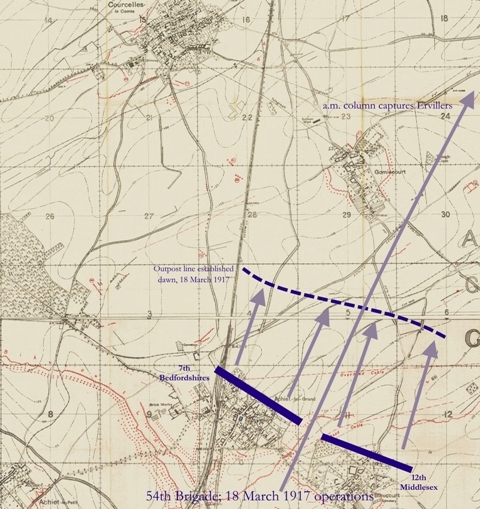 Stronger parties were called forward but had to cut their own gaps in the untouched wire in front of the trench system, finally occupying their entire sector of the line from the junction with the railway south-east of Achiet-le-Petit by 10 a.m. As Achiet-le-Petit had not fallen to the 62nd Division's assaults, the 11th Royal Fusiliers deployed a line of outposts lining the forward slope facing north-west towards the village, thus protecting the 54th Brigade's open flank. 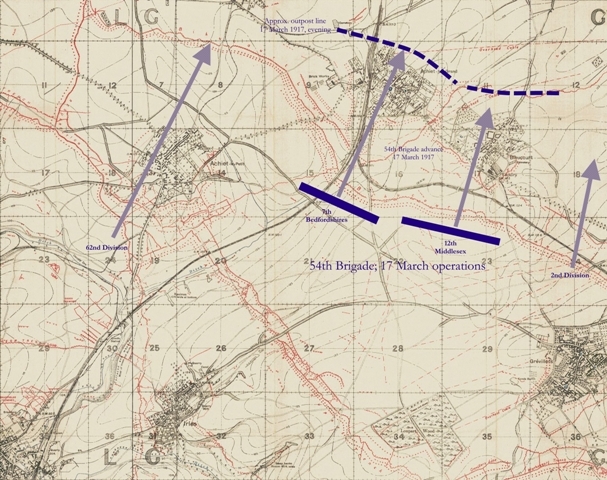 With orders to continue the pursuit, the brigade's three assault battalions pushed battle patrols forward across the open ground north-east of the Loupart Line, to establish where the new German line of resistance had formed. The Bedfordshires advanced into hostile machine gun fire coming from the high ground around the star-shaped crossroads (referred to as Hill 130) and after a short skirmish, captured 2 guns, took over the positions and extended their left flank back to meet the Royal Fusiliers whose right flank was in the Achiet Trench, 200 yards south-east of the railway line. Private Cox and his fellow stretcher bearers worked tirelessly - as they always did - during and after the operations, with several of his colleagues becoming casualties themselves during the assault and subsequent German bombardments. To the brigade's right, the 2nd Division had also advanced alongside and all along the line, snipers moved up to observe the Bihucourt Line. Patrols from all assault battalions ventured forward but were met with heavy machine gun and rifle fire, which confirmed that the Germans held the line and Achiet le Grand in force. Overnight, the Northamptonshires were withdrawn into brigade reserve, leaving the Bedfordshires and Middlesex facing the Bihucourt Line and the Royal Fusiliers facing north-west towards Achiet-le-Petit. At 9 a.m. on 14 March a patrol of Bedfordshires returned and reported that German forces were seen to be 'massing' in the Bihucourt Line, around the railway junction south of Achiet-le-Grand, which coincided with the Bedfordshires holding the high ground coming under heavy shell fire. All available British batteries in the area concentrated their fire and broke the counter attack up before it left the shelter of the German trenches. Private Cox and his fellow stretcher bearers had another busy day moving casualties back across the open ground towards the regimental aid post south of the high ground as the afternoon and evening saw the brigade front lines come under more heavy shell fire, which made the commanders on the spot wonder if the defenders were vacating again. Patrols probed forward but came under heavy machine gun fire, although a Middlesex patrol made it into the Bihucourt Line unmolested before dawn on the 15th, signalling the opportunity for a further advance. The report made it back to the brigade lines as dawn was breaking so although larger battle patrols were quickly formed and advanced to take control of the empty German trenches, they came under heavy machine gun fire from the two villages almost as soon as they emerged from their shell holes. Going to ground between their former positions and the thick belts of German wire, the stretcher bearers went to work once more despite being the target of German gunners and the constant German bombardments that rained on the British positions all day. Private Cox was soon working alone, having lost his partner but it did not deter him from continuing. Second Lieutenant Sydney Ronald Chapman was in a shell hole in the front line and witnessed Private Cox going to work; " I saw him wandering about in front of hill 130 in the front wave attending to the wounded. He showed absolute contempt of the volume of machine gun fire and heavy bombardment, although M.G. opened on single targets. I previously saw him carry back a man on his back on three different occasions, and on withdrawing my Company I found he had similarly treated six others, two of whom were wounded a second time while he was carrying them". On his return journeys having dropped the wounded men off at the regimental aid post, Christopher also ferried machine gun and other supplies to the front line troops. 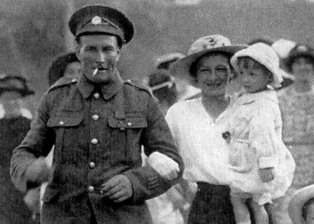 On more than one occasion, whilst carrying a wounded comrade on his back, the wounded man was hit again but Private Cox carried on despite knowing he was being targeted by the German gunners. Second Lieutenant Francis Everard Dealler watched him carrying a casualty through a hail of aimed machine gun fire, completely ignoring it as he did so. Returning later and arriving in Dealler's shell hole, Cox reported what work he had completed and asked for the next location of any wounded men. With no immediate reply being forthcoming other than suggestions that he took a breather, Christopher advanced back into the fire on his own initiative and disappeared once again, completely disregarding the attention of the German gunners who had so few targets to fire at. Once he had found and treated or moved all of the wounded Bedfords he could, Christopher turned his attention to the Middlesex men who were next to them in the advance. Second Lieutenant Dealler added "He did not rejoin the Company till about 12 hours after and although a very powerful man, whom I have never seen tired before, he was thoroughly exhausted". Later that day, information was passed into the front lines that the German defenders were expected to evacuate and that brigade had organised an 'all arms column', so the Bedfordshires and Middlesex should be ready to move at short notice. Despite the heavy shelling, the 16th was a 'quieter' day and the anticipated orders to advance did not materialise. Although the fighting troops remained in their lines and patrols were sent forward, discovering that the Germans were still in place, Private Cox continued moving around in the open, finding men he had missed the previous day and ferrying supplies back to the front lines. Other than the spectacle of their remaining stretcher bearer moving around in the open with such contempt for the German gunners who were trying to hit him, the only distraction for the men under fire in their shell holes was the signs of both villages having been set on fire, further suggesting that the Germans were evacuating. News arrived overnight that Anzac patrols had entered Bapaume so the brigade readied itself for a new days of operations and early morning Bedfordshire and Middlesex patrols reported the Bihucourt Line was unoccupied. Although the Middlesex troops entered Bihucourt without much opposition, they could not advance beyond the village limits as they came under heavy machine gun fire from several positions. On their left, the Bedfordshires left their shell holes and came under an intense machine gun and rifle fire from Achiet-le-Grand but broke through the uncut wire, moved into the village and cleared it of all positions. On the brigade's left, Achiet-le-Petit also fell to the 62nd Division and with the 2nd Division on their right also advancing, the British line was moved forward on one bound. Private Cox had advanced behind the first wave as the company to his front had lost all of their bearers. Despite being under fire, on passing through the gaps in the German wire whilst looking for wounded men he paused to mark the passages that allowed following waves to move quickly through them later on before going about the day's business of treating and carrying his wounded comrades back across the open ground. With the two villages under control, carrying parties set to work and the troops prepared for a defence, just in case a counter attack should come their way, with any unguarded movement coming under the scrutiny of German machine gunners and artillery observers. As a result, Private Cox spent another day moving around in the open, under fire, ferrying wounded back and supplies forward on his return journeys. Before dawn on 18 March, Bedfordshire and Middlesex patrols found that the German line of posts north-east of the two villages were empty so both battalions pushed patrols 800 yards to the north-east so the 'all arms column' could pass through the village and move into the open countryside unmolested. With the bulk of the column formed from the Northamptonshires, a squadron Yorkshire Dragoons moved on their open flanks and detachments of machine gunners, Royal Engineers and Royal Field Artillery supported the infantry. They took Ervillers unhindered as the rest of the 54th Brigade remained in position in the villages, with their outpost line 800 yards north-east. The column's cavalry made contact with the next line of resistance on high ground between Ervillers and Saint-Léger, with the Northamptonshires reaching a line between Ervillers and Béhagnies, in touch with divisions on either flank. The column advanced the following day, occupying Saint-Léger without opposition but Croisilles was strongly held so an outpost line was formed around the north of Saint-Léger, connecting to the divisions on either flank. That afternoon, the Royal Fusiliers moved up and occupied a line between Saint-Léger and Vaulx-Vraucourt with two companies, the balance staying in Mory as the Bedfordshires moved to Ervillers and the Middlesex moved to Béhagnies and Sapignies. Orders arrived that the 54th Brigade was relieved that afternoon by the 20th Brigade, 7th Division and by 4 p.m. the Bedfordshires were concentrating in the Bihucourt / Loupart Line area, their part in the pursuit having been completed. The division were moved into the reserve areas to refit, retrain and prepare for the next operations, which would see them in action at the Battle of Arras. Over 100 officers and men of the 7th Bedfordshires had been killed or wounded during this phase of their winter operations, which had left the British forces facing a new challenge - how to break the remarkable Hindenburg Line. As the recommendations were moved back through the chain of command Christopher went about his daily business of being in the battalion. Six weeks later the 18th Division assaulted German positions around Cherisy during the Battle of Arras and the battalion were attacking south of the village. They advanced on the heels of the British bombardment only to find the wire uncut, after which the front waves had no option but to dig in and shelter from the crossfire and artillery barrage that rained down on them that day. It was during the advance that Private Cox was wounded twice in the foot and was helped off the battlefield by one of his mates. After an operation to remove the bullets he was invalided back to Blighty, to the Queen Mary Military Hospital in Blackburn. 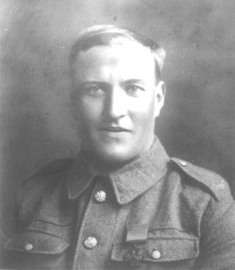 Christopher Cox was presented with the Victoria Cross by the King on 21 July 1917 at Buckingham Palace, being one of 32 Victoria Crosses presented that day. 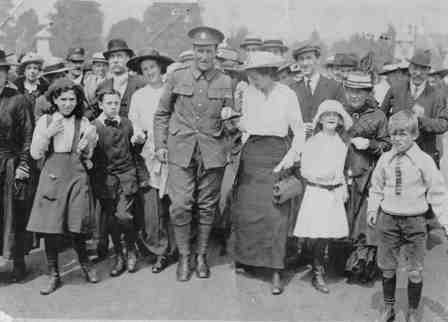 The photograph below shows him with Maud on returning to Kings Langley after the presentation ceremony - note his three wound stripes on the lower left cuff of his uniform. Private Cox was unable to return to the front again after receiving his third wound as he did not regain full fitness afterwards. Instead he helped to train the new recruits rather than being idle and of no use to his country and comrades. Christopher was a very unassuming man who did not appreciate the fuss that surrounded his award. In an interview after it was presented he simply said "I was only doing what any British soldier would have done". Modest perhaps, but it appears to be a genuine reflection of his character. On his return to Kings Langley, Christopher gave a speech at his local hall but remarked that he would rather be in the trenches than give a speech to a group of people. In the aftermarth of his award. Private Cox was offered a Commission as well as a house but refused both, saying he would not accept a penny for his fallen comrades. After the war he returned to live in Kings Langley and loved to spend time in his garden. He worked for a few years for a builder, then worked for another 32 years as a Maintenance Labourer at the Ovaltine Factory. During the Second World War he served in the Home Guard and again showed his courage by entering the bombed-out Griffin Pub to search for the publican in the ruins. Unfortunately Ted Carter was already dead, the only civilian killed in Kings Langley during the war. After the war he was back at work in the factory when, in 1954 aged 64, he fell off the factory roof. This avoidable fall put him in hospital on and off for the rest of his life. Christopher Cox, V.C. died 28 April 1959 aged 69, the father of eight children. 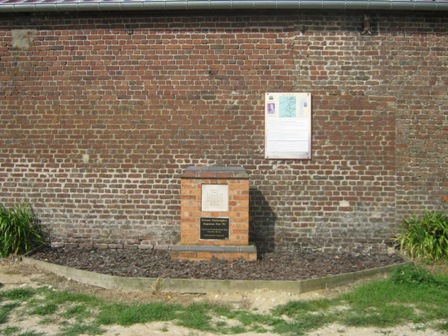 In 2006 Mr Philippe Drouin of the Somme Remembrance Association started to organise a plaque that was to be laid at a remembrance ceremony to mark Christopher's Victoria Cross as well as to honour those who fell whilst liberating his home village of Achiet-le-Grand. 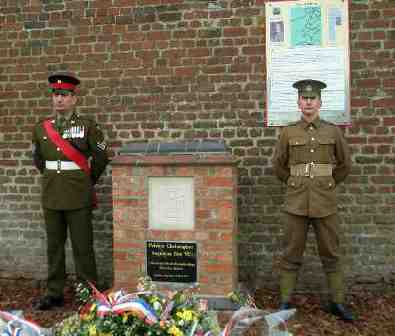 On 17 March 2007 the unveiling of a plaque of remembrance to Christopher's V.C. and those who fell at Achiet-le-Grand saw a well attended ceremony. The photographs below are a few from the event, showing (from left to right) a lovely representation of the Old Guard standing next to the New Guard and the memorial. Later that year another ceremony was seen in Christopher's home town of King's Langley. A rededication ceremony is planned for March 2017 - by Philippe Drouin once again - during which he intends to update the information board. More details, including the opportunity to donate towards the panel, can be seen here. Mary Hallett has also written a biography on Christopher Cox, V.C. called 'Without Hesitation'.